This is a sponsored post written by me on behalf of Hot Tools. All opinions are 100% mine. I love the way my hair looks every time I leave the salon, but I could never recreate it at home. 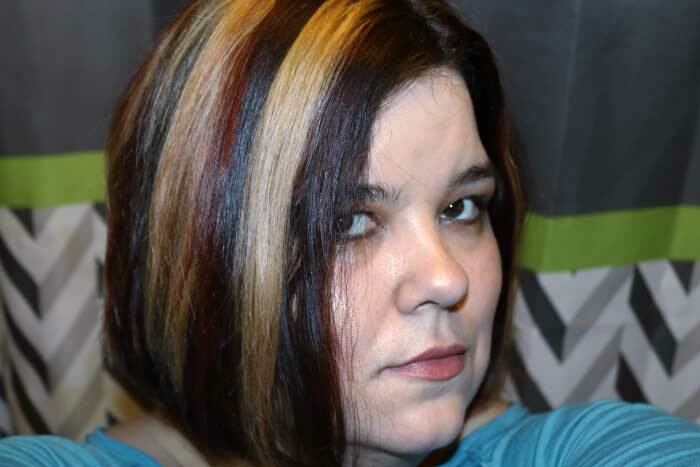 Yes, my hairdresser has training and experience that I don't, but I have experience with my own hair, so why couldn't I get a decent blow out or flat iron it right at home? I wasn't using the right tools at home. My inexpensive flat iron and hair dryer just weren't able to to give me the same results as my stylist's tools. Even with almost daily use, I couldn't see spending a lot of money on my hair tools. I'm so glad I found Hot Tools new Signature Series line. They are affordable because Everyone Deserves Beautiful. You've probably seen Hot Tools at your salon; several of the stylists at the salon I go to use Hot Tools hair dryers, flat irons, and curling irons. 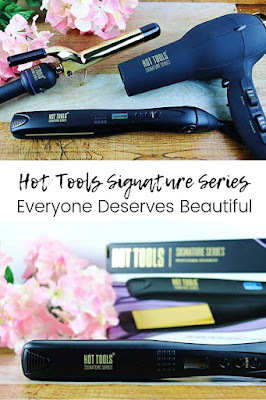 Hot Tools just launched their Signature Series, which are affordable hair tools that you can get from Amazon or Walmart. I'm a believer in buying the best quality that you can afford, but I don't think that necessarily means getting the most expensive. 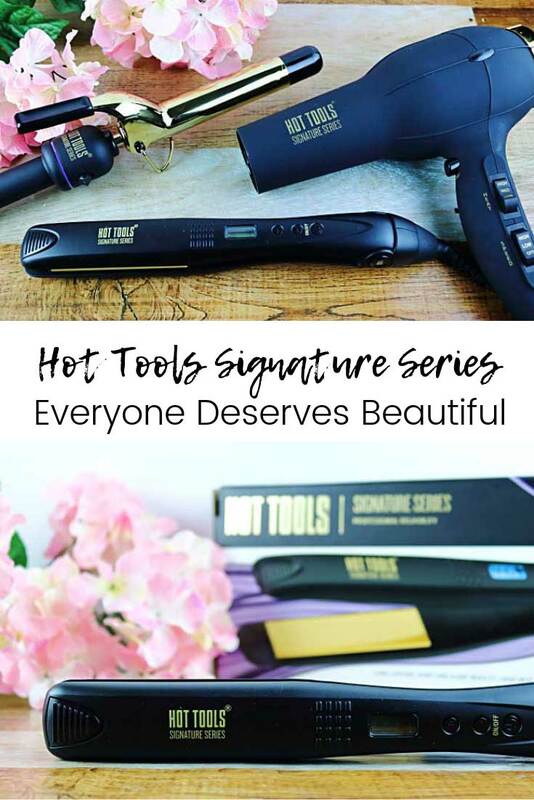 The Hot Tools Signature Series is designed to give you affordable hair tools from the same trusted brand that many salons use. I've never had a professional quality hair dryer, but it was high on my wish list. I could never get a blow out nearly as good as my hair dresser can, so I knew I needed to invest in a better dryer. The first thing I noticed about the Ionic Turbo Hair Dryer is that it's lightweight. It may not seem like a few ounces matter, but my hair is really thick and takes forever to dry. The dryer is also very comfortable to hold. It has a really cool texture and feels comfortable in my hands. My favorite feature is that it's designed for turbo drying, so it has maximum airflow for faster drying time. Pair that with the ionic technology, and my hair dries in much less time. I used to not like drying my hair at home because it took so long. No matter how hard I tried, it would be frizzy and have too much volume. Yes, that's a thing when you have thick hair! It has two speeds for six heat combinations, so there's a setting for every hair type. I always finish with the Cool Shot to close the hair cuticle for smoother looking hair. It comes with a concentrator and a diffuser, so I can use it whether I want my hair curly or straight that day. I use a flat iron at least twice a week, so I was excited to try the Hot Tools Signature Series Ceramic Flat Iron. Before I even turned it on, I knew I would love it because of the ergonomic design. Every flat iron that I've used before has been completely flat. This one has a curve on the handle, and it is so comfortable to use. I have arthritis in my hands and flat ironing takes me a little while with my thick hair, so I really appreciate the comfortable grip. The 1 inch flat iron is ceramic, so it distributes heat evenly. This means less damage to your hair over time since you don't have to crank up the heat to get all of the plate up to temperature. It goes up to 440 degrees Fahrenheit, so it can be used for all hair types and textures. It uses Pulse Technology®, so it gets hot and stays hot. I've had flat irons that seem to heat in cycles, so part of my hair looks great and other parts are not so great. By having an even and constant temperature, I get consistent results, and my hair looks and feels great. I use the Hot Tools Flat Iron most often because I straighten my hair all the time. This is my hair before straightening it. Notice the brushed out curls going all over the place. The ends really seem to want to do their own thing. 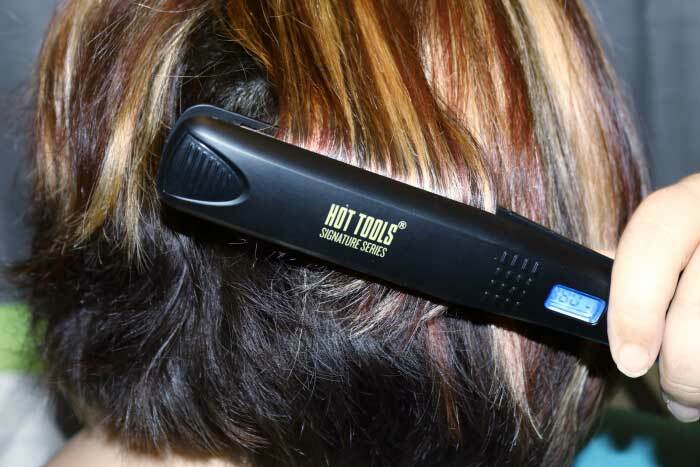 The Hot Tools flat iron saves me time because I only have to make one pass over my hair. I used to have to hit the top and even some of the ends two or more times to get it straight, but this gets it straight and flat on the first pass. Even though I have curly hair, it still needs some coaxing to turn into pretty curls. It tends to be on the wavy side of curly if I let it go, so I use my a curling wand to get perfectly shaped curls. This is a 2-in-1 curling iron and curling wand, so yay for fewer products in my beauty cabinet. Like the dryer and flat iron, it has a comfort grip and is lightweight. The tip is extra long, so I can hold onto it without burning my fingers when I use it as a curling wand. The curling iron also uses Pulse Technology® - Gets Hot…Stays Hot®. The constant temperature helps you get better looking curls and lets you curl your hair on a lower heat setting since the heat is consistent. The curling iron goes up to 430 degrees Fahrenheit, but for best results, curl your hair on the lowest heat setting that works for your hair. Everyone Deserves Beautiful. Pick up the new Hot Tools Signature Series at Walmart, Amazon, or other mass retailers.